A brief look at the hypocracy of the defense of the use of the double bridle in dressage. We recently came across an article about the rule change in US dressage tests 10 years ago, that permits double bridles to be used in third level competition, and also removed the fifth level tests that allowed the use of a snaffle at a higher level. This regulation change effectively encouraged the use of double bridles at lower levels of training and by more amateur riders who compete at this level. This article (click here) is a justification of this decision written by a renowned judge, but some of the views expressed shocked us in their fundamental misconception of correct dressage. The article states that the use of double bridles to achieve collection (even at lower levels of training) cannot possibly do harm by force because 'the double bridle cannot force something that the horse has not the strength to do'. In fact, yes, the massive leverage that a double bridle has against the horses mouth and poll CAN force the horse to perform 'collected' movements that it does not have the strength to perform in engagement. Instead, when blocked by the hand in this way, the collection achieved is false, hollow and disengaged. One only has to look at footage of rollkur to see what monstrosities it is indeed possible to force a horse to do with a double bridle. 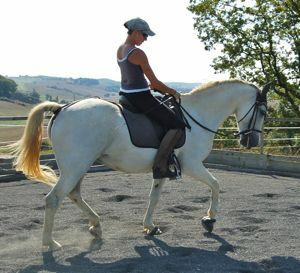 The article also states 'The thinking is that through the use of the stronger bit, riders will become more confident to allow the horse to come into collection. With this kind of confidence, more competitors will be riding the horse 'back to front'into a hand that seeks to balance the horse rather than to restrict him.' This is essentially an admission that in competitive dressage, it is fully accepted that riders are balancing the horse with the hand (which is only restriction under another name), and that the stronger the bit is the more effectively they will be able to do so without any embarrassing resistance showing up. What has happened to the foundation of dressage being balancing the horse with the seat and legs, through correct straightening, bending and engagement?! The bizarre conclusion of this article is that more use of the double bridle in dressage will result in happier horses, because there will be less resistance than with snaffle bridles - this apparent lack of resistance is because horses have NO CHOICE but to submit to the force the double bridle exerts on them, rounding their neck, so they give in and stop fighting overtly. It is NOT because they are happier! At least a horse who can hollow and resist the bit is protecting his back to some extent, the damage done when a horse is forced artificially round in front whilst still being hollow in the back and disengaged behind is profound and long lasting. It is an aberration of the true ideal of dressage, where the horse becomes stronger and more supple, able to carry the rider in true balance and freedom of movement. For more on this subject, look at Dressage Double Bridle Misconceptions. 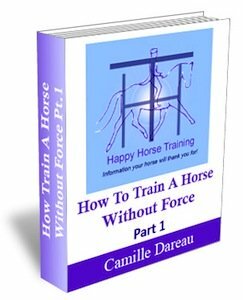 HHT's free monthly newsletter, giving you wide-ranging insights into holistic horsemanship. A unique guide to training horses through energetic connection and gymnastic training. Part 1 covers everything on the ground, from handling to the lungeing technique that develops strength, straightness and engagement.